In our home, we abide by the rule that Sundays are a day of rest. We both work long hours during the week take our time away from our respective jobs pretty seriously. Some weekends we spend up at Putty, about two and a half hours north west of Sydney. Dan’s old business partner has a property up there where we go to get away from the city life. There’s little to no mobile phone reception, no running water and the only power we have is off either a generator or solar panels. To some, this rough lifestyle isn’t their definition of rest and relaxation, but to the hubby and me, it’s the perfect way for us to decompress. This weekend we finally started getting the soil ready for a small veggie patch. I don’t have the liberty of space to grow things in our tiny apartment in Sydney, so hopefully I can get a few veggies growing up at the weekend getaway. You can read more about our Putty adventures and the veggie patch on my adventures page. With the days getting shorter and the air getting much cooler as autumn rolls in, there’s no better way to enjoy a lazy Sunday than with a slow cooked meal. If I’m spending the day at home, I love to get the slow cooker going in the morning so dinner is sorted. I get to spend the day doing what I want (which if you know me, most likely involves food), and the slow cooker does all the hard work for me. It’s a win win situation all around! 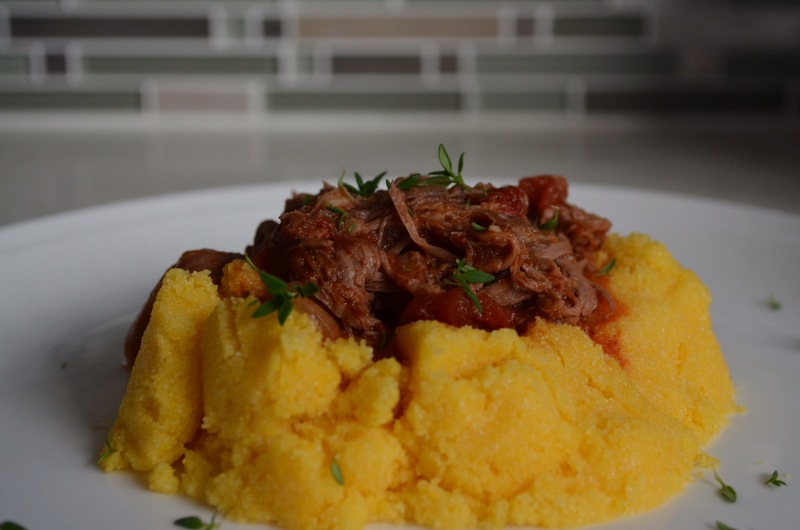 This week I decided to try out a slow cooker beef ragu with polenta recipe that’s been sitting in my Pinterest collection from A Pinch of Yum, along with a fondue camembert surprise appetiser I saw on Chef Club. The images on APOY make me salivate, and the recipe seemed too easy to mess up. If you don’t know Chef Club, get on it! Chef Club publishes extremely easy recipes to create sinfully decadent dishes. Most of the videos from Chef Club that come through my social media feeds are in French. Lucky for me I can read the recipes as they are, but seriously if it looks good, get the recipe translated and try it! Slice the top of a whole garlic head. Place the head of garlic on a sheet of aluminum foil and pour a generous sieve of olive oil. Close the aluminum paper and bake the garlic at 200 ° C for 35 minutes. Using the tip of a knife cut a circle to remove the top of the camembert. Remove the garlic from the oven and use a spoon to empty the pods. Spread the garlic purée in the circle cut at the top of the pie. Grill the bacon in the frying pan for about 5 minutes. Place the toasted bacon in the center of the puff pastry. Cover the bacon with the turned-over camembert. Close the puff pastry around the camembert. Brush egg yolk with a brush. Bake at 190 ° C for 25 minutes. Peel and cut into pieces the potatoes. Fry the potatoes in a frying pan with a fillet of olive oil, salt, pepper and herbs of Provence. Remove the Camembert from the oven and remove a circle of puff pastry at the top. Taste by soaking the potatoes in the cheese. The Good, the Bad, the Inedible. Part One. Okay, this recipe is the bomb. A cheesy gooey, sinfully delicious bomb. And it’s as easy to make as the video shows. The only downside that may qualify as inedible in this recipe is the pastry underneath the cheese. Because this part has the most amount of crust, it doesn’t bake completely. But to me that’s not a deal breaker. There’s also the factor that as you will not just take one bite of this cheesy goodness, you’re pretty much eating an entire wheel of cheese….in a buttery crust. With bacon. Be prepared to say goodbye to any diet you’re on! To some, the roasted garlic might be a turn off, and there is a very fine line between just the right amount of garlic to too much. I tried this recipe twice, 1 because that’s one of my rules and 2 because cheese is my life. I created a version using caramalised onions and it was just as incredible as if you used roasted garlic. Really up to you which you prefer. In all though, I wouldn’t change a thing with this recipe. If you want to try this with other dipping items, try it with broccoli, apple, bread cubes. Anything you would dip into a cheese fondue would go well with this yummy yummy goodness. As a side experiment I also tried one version using French Camembert and another using Australian Camembert. I’m half French, and I’m fairly certain that this side of my family would disown me if I didn’t like any cheese that didn’t smell like an old musty cellar like a good Camembert does. One of the biggest differences I find with the Australian version of this cheese is the smell and consistency. I have never found an Australian Camembert that runs once it’s been out of the fridge for a bit, nor have I found any that have the iconic musty smell. To be honest, Australian Camemberts seem more like brie in their mild flavour and texture, and I certainly can not tell the difference between and Australian brie and Camembert. A true Camembert will always be a French Camembert! But hey if you know of an Australian cheese maker that you think makes a great musty, runny stinky Camembert, do let me know! HOWEVER. The Australian Camembert gives a significantly more thick and gooey consistency compared to the French version where the cheese was quite thin, almost too runny. So which one is the winner here? If it’s about texture, the Aussies win. If it’s about pungeuncy it’s the French. If you want to try this recipe with a good French cheese, surprisingly Costco has an excellent variety of reasonably priced imported cheeses. Besides the Camembert they have British Stilton and Cheddar, Spanish Manchego, Italian Parmesan and Pecorino, among other varieties. Optional, but for best tasting results: Heat the olive oil in a large, deep frying pan. Add the beef in one whole piece and fry on each side for about 5 minutes, turning until the whole exterior is golden brown. For the polenta, boil the water and add the salt. Slowly add the cornmeal, whisking constantly to avoid lumps. The polenta will start to thicken quickly. Continue whisking or stirring for 2-3 minutes before removing from heat. Stir in the butter until melted . For solid and chewy polenta, pour into a rectangular dish, let cool for 15-20 minutes, and cut into pieces. For softer polenta, serve scoops of polenta immediately before it has hardened. For a slow cooker recipe, this one is really not too bad. It’s incredibly easy to make, and has a few simple ingredients and steps. But that’s the problem. This recipe is almost too simple. In essence this ragu is just tomatoes and beef. It lacks dimension and depth of flavour, and is actually quite acidic. Also, both instances came out a bit watery. When I think of ragu I think of melt-in-your-mouth fall apart beef with a thick tomato sauce, where it’s the perfect balance of beef, sauce and whatever you use to soak up the sauce. And this ragu just doesn’t cut it, at least for me. I had a look at a few other ragu recipes and from what I’ve gleaned there are a few ingredients missing to give this ragu some depth and thickness – carrots celery and more tomato paste. Now that I think about it, a ragu is essentially a tomato beef sauce, so it only makes sense that the vegetable backbones of a tomato sauce are included in this recipe. Nearly doubling tomato paste helped thicken this sauce immensely, which is exactly what I was hoping it would do. The carrots and celery fall apart within the beefy sauce, giving it a wonderfully smooth texture and adds that missing depth to the dish as a whole. APOY also suggests to brown the beef before adding to to the slow cooker. Definitely do this step. It helps create a seal to keep all the beefy juices in. Plus whole doesn’t love the smell of meat grilling in a pan? Bring your inner neanderthal out! Polenta is not everyone’s favourite. Being from Southern part of the United States I adore grits, which is pretty much a white corn version of polenta. So for me I certainly don’t mind polenta with the dish. The hubby, not so much. He was a really good sport though and still tried it. We also tried the ragu on roasted potatoes, which the hubster preferred. 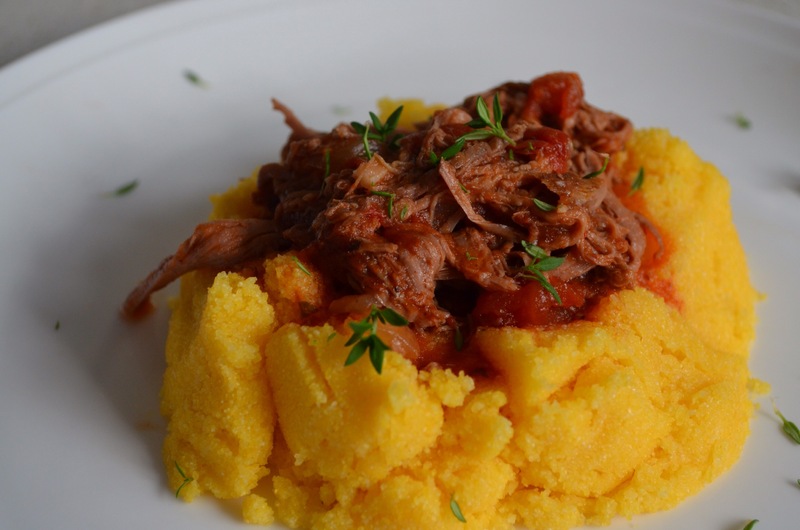 If you want to replace the polenta with something else, try pasta, rice, couscous or even mash. Essentially ragu can go with any grain, pulse or starch. Here’s my amended version of the Ragu. Feel free to let me know what you think. Buon Appetito! Heat the olive oil in a large, deep frying pan. Add the beef in one whole piece and fry on each side for about 5 minutes, turning until the whole exterior is golden brown. Place all remaining ingredients with the beef in a crockpot or slow cooker. Cover and cook on low for 7-8 hours. When the beef falls apart easily when pulled at with two forks, it is ready. Shred the beef into pieces and give it a good stir. Leave the ragu on low for another 30 minutes to 1 hour, whenever you’re ready to serve. For the polenta, boil the water and add the salt. Slowly add the cornmeal, whisking constantly to avoid lumps. The polenta will start to thicken quickly. Continue whisking or stirring for 2-3 minutes before removing from heat. Stir in the butter until melted . For solid and chewy polenta, pour into a rectangular dish, let cool for 15-20 minutes, and cut into pieces. For softer polenta, serve scoops of polenta immediately before it has hardened. Alternatively, serve over pasta, roasted potatoes, mash, or rice.